Good morning crafty friends and happy Friday! Anyone have big weekend plans? I wanted to share a card I made following the current sketch from Cardabilities. enough, or that they are too difficult so I shy away. I'm trying to get over that! 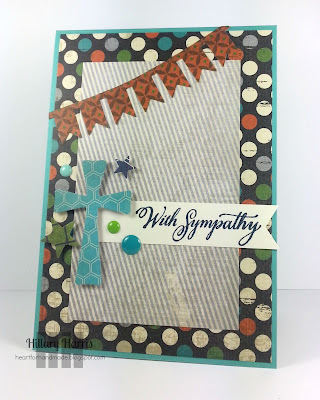 HI..Your card looks lovely, the sketch has worked well for a sympathy card.. thanks for joining in with Cardabilities..
WOW ... what a fabulous take on our sketch! Love It!! Thanks so much for joining our challenge at Cardabilities! We hope you’ll join us again real soon! Good Luck! That patterned paper cross is so cool! Such a fabulous card, Hillary! Beautiful card! Thanks for joining in with Cardabilities.